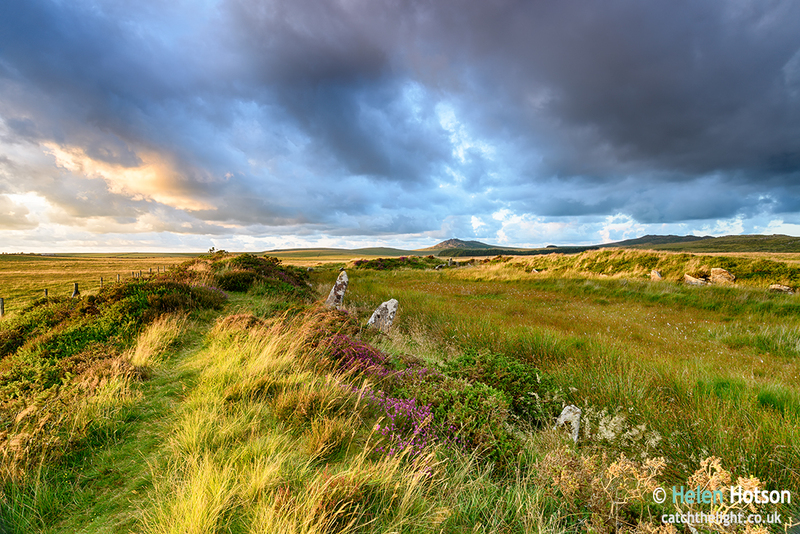 Sunset sky over King Arthur’s Hall, a mysterious ancient Neolithic monument made up of standing stones in a remote part of Bodmin Moor in Cornwall, its purpose remains unknown. King Arthur’s Hall consists of fifty six stones arranged in a rectangular shape with a bank of earth around the edge. The inside of the Hall dips down and is now flooded with water, with pond and marsh plants in abundance. The Hall is situated on King Arthur’s Downs near St Breward, there are some fantastic views across open moorland with the peaks of Roughtor and Brown Willy in the distance. The easiest route is to park at the De Lank Waterworks and walk up the hill to the left where you can see a small fenced area in the distance at the top. It is approximately half a mile.